YOU ARE HERE, 2015. 7.5 x 7.5 x 1.75 in. Digital offset printed, 500 pages. 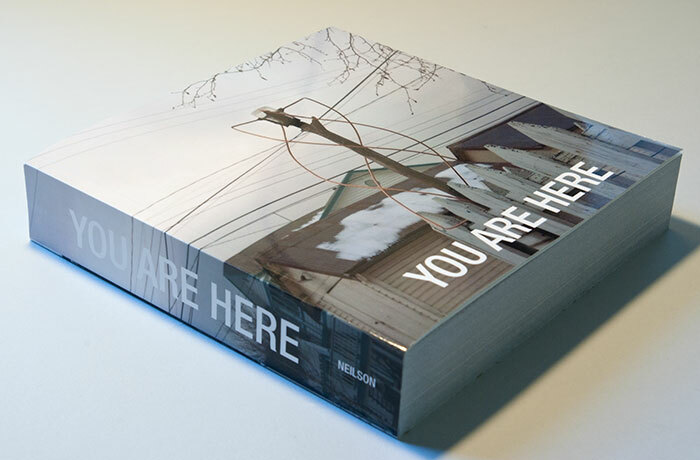 YOU ARE HERE contains transmissions received from weather satellites—NOAA 15, 18 & 19—while I was an artist-in-residence at the Klondike Institute of Art and Culture in Dawson City, Yukon Territory, Canada, in October and November of 2014. I received the transmissions using a radio USB dongle, a computer, and a quadrifilar helicoidal antenna I made from coaxial cable, copper tubing, and found materials. Using fax-like software, I converted the transmissions to reveal images of Earth and its weather patterns high above the Yukon. 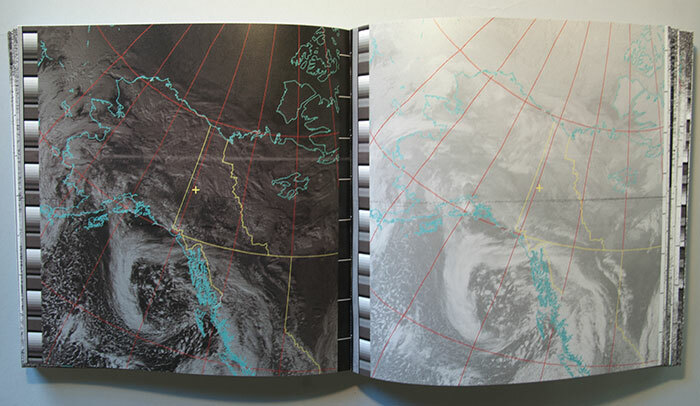 Each page spread is the data collected during one pass of a satellite, consisting of the two image channels transmitted, one image per page. The location of Dawson City is indicated on each page with a yellow marker, and is different from transmission to transmission, depending on the relative positions of the satellite and Dawson City during the passage of the satellite.